Solar panels harness the sun's energy and turns it into free, green electricity for your home. 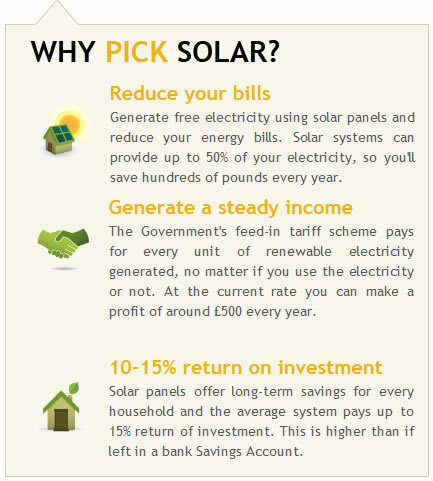 By installing solar panels on your roof you can dramatically cut your electricity bills, as well as generating a steady income from the government's feed-in Tariff. You could be making over £500 per year with a basic system with some larger systems offering a return up to 3 times this figure! At the moment the government offers a tax free payment of 21p for every unit (kWh) of electricity you generate, which is guaranteed for 25 years. On top of this you will be providing your home with free electricity reducing your bills by up to 50%.